Buy Cranium and PriceWatch, Buy this board game at the Lowest Price. Sketch, sculpt, solve puzzles, act, hum, and answer questions. Cranium is the outrageous, award-winning board game packed with something-for-everyone fun! Whether you're an aspiring actor, artist, data hound, or wordsmith, Cranium gives you a chance to shine. Cranium brings families and friends together - after dinner, at parties, on rainy afternoons. When you play Cranium, you'll use your brain in ways you never imagined and find yourself doing the unexpected. And the fun doesn't end when the game does - you'll never forget your uncle impersonating Celine Dion, your sister acting out "pigs in a blanket", your mom spelling "asparagus" backwards, or your best friend sculpting Humpty Dumpty out of clay! 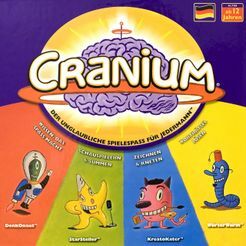 Cranium includes the Cranium board, 600 outrageous cards covering 14 activities, a ten-sided Cranium die, a tub of cool Cranium Clay, a timer, Cranium pads and pencils, and four Cranium play pieces. Actual brains not included! Cranium helps people find the fun in all things and brings light and laughter to the lives of people who play. The game is perfect for parties, reunions, after dinner, vacations, anytime! Each game lasts about an hour and hilarity is guaranteed.